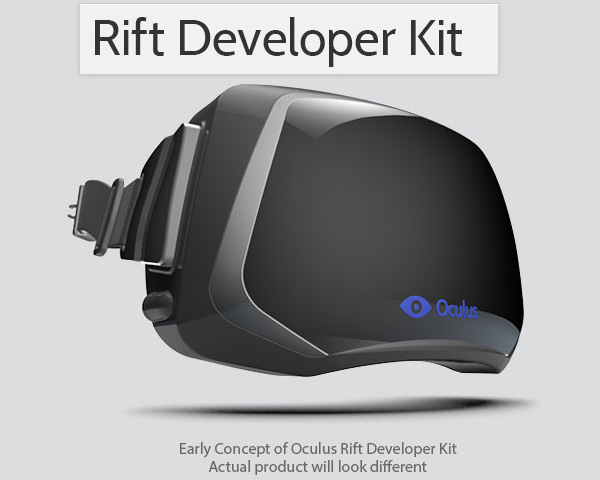 While the people behind the Oculus Rift are currently busy preparing the early Dev kits of the device for all of the Kickstarter backers, they have also started taking pre-orders, mind you it is still for development kits of their 3D-capable HMD device. There is a special page up for the pre-orders of the development kit of the Rift and it will cost you $300 USD if you are baed in USA or $345 USD including International shipping for the rest of the world, the estimated delivery in January 2013 (the kits for Kickstarter backers have priority of course). The first 1000 pre-orders through the dedicated page will also include a free copy of DOOM 3 BFG Edition, the first Oculus-ready game. They are definetly going all out. I assumed when product was first announced it was just hardware that would rely on third party support. The software job openings is definitely a good sign. Hopefully they will get nvidia to do side by side support(a man can dream…). I sooooo want this! Just dont know if i want to deal with development issues or wait for the finished product. Anyone know what the max resolution the Oculus Rift will be able to display. I hope its high!!! 4K res would be nice! I cant imagine having a res similar to 1080p 2 inches away from my eyes……. Can someone tell me, how does the image looks like from inside this helmet? How large the screen image is? Is it like sitting and watching tv from a distance, or is it like watching a 100″ projector screen from 50 cm? Is there a stereo image for each eye, or is it 2D? Its side by side (SPLIT) 800 by 600(HALF per eye) that per eye. I dont want to bash it since I havent tried it. But thats low. Projector would be 1280×720 per eye(gaming) or 1920×1080 per eye. Some reviewers said they felt the low res immediately, some didnt. Eye sight will be a huge factor. Im not sure of FOV factor to comparing to that. Its very high, like 50% bigger then the hmz-t1 but 100″ at 50cm i think is impossible. Unless your like wierdly reclined or something. Also don’t forget that the optics provide a higher pixel density in the centre of both sides where it really matters and less at the edges. The videos from the site do a good job of showing how it works. Its 110 degrees FOV. Its low res for sure, but this is sort of the prototype. Then mention coming up with a higher res version later. A projector is still better than any HMD I have used. I had the sony and have the SMD and they are just not immersive. Its just like watching a screen from a distance. The Oculus should change that and finally get you inside the display. The optics are very different, so I hope that they can do high res with that type of optical design. The bad news is… no mention of S3D. Its a 2D distortion injector. Someone will offer a free version…. trust me.